UPPER cut about half deck with right hand and place the two packets end to end in position for riffle. 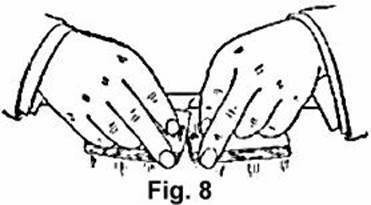 Seize both packets at sides close to adjoining ends between second finger and thumb of each hand, the third and little fingers curled in, with the first joints resting on top of packets. Raise thumb corners and release bottom stock; first with left thumb, then continue action with both thumbs until all cards are riffled in. (See Fig. 8.) Push both packets together in the ordinary manner and square up. There is no necessity of covering the bottom stock as in the instance of the top stock, when squaring up; because unless it is very large it is not noticeable, and more than a half dozen cards are rarely held there. However, the same plan used to conceal the top stock may be adopted if desired. right packet. This method prevents any possible difference in the sound of the riffle, though when cleverly performed it is imperceptible to the ear. Bottom Stock" with this riffle. In performing the Top Stock Riffle, the use of the third fingers and the positions of the hands and other fingers, are very important, as concealment is an essential of the blind. But in the Bottom Stock instance, and especially when the stock is small, the action of not interlacing the bottom cards is not perceptible, and the handling of the deck should be as open and artistic as possible. Hence the use of the second fingers and the curled up positions of the third and little fingers. Just here we are reminded that comparatively few card players can make an ordinary riffle with any degree of grace or smoothness, and especially few understand how to square up properly. But the whole process is of the simplest nature, and so much easier than clumsy force, if the right method is adopted. hands again, bringing the thumbs together at inner side, and a second finger at middle of each end, and square up the deck perfectly by sliding the thumbs outward along the side, and the second fingers inwards along the ends (see Fig. 10) until they meet at the corners, squeezing or pressing the cards into position in the action. easier to execute, more perfect as a blind, and answer every purpose. there would be little advantage derived from clever shuffling, were the order to be subsequently disturbed in cutting. The able card handler with a player on his right to blind cut, has the game well in hand. Yet though the advantages are greatly increased by the assistance of an ally, the reader will learn how it is quite possible to play alone and still have a very tolerable percentage of the chances in one's favor. Both hands are invariably used to make a blind cut. The first described is an excellent one for retaining either the top or bottom stock and is in common use among professional players.